Home/Posts/Social mobility opportunity areas: déjà-vu, again? On Tuesday, Justine Greening announced that six parts of the country have been designated social mobility opportunity areas, with a further four areas to be announced at a later date. The initiative will see these ten areas share £60m in funding, with schools in these areas partnered with those in other parts of the country, and links developed with local businesses in the hope of raising children’s aspirations. 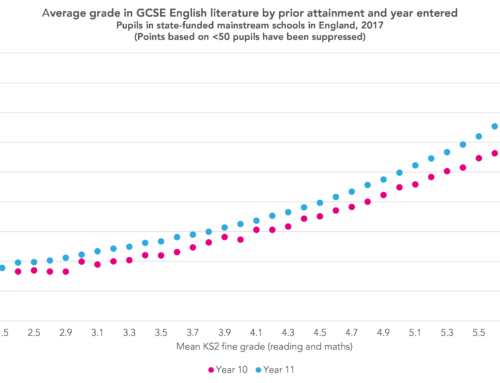 The opportunity areas replace the achieving excellence areas proposed in former education secretary Nicky Morgan’s white paper in March [PDF], which gave significant prominence to the influence which geographical factors have on pupil attainment. But the question of whether where a child lives is a cause of low educational attainment has been a recurrent theme in education policy since the publication of the Plowden report on primary education in 1967. That report proposed the establishment of ‘educational priority areas‘ – defined as areas where low attainment was reinforced by social disadvantage. In practice, around 500 schools in designated educational priority areas received additional resources, allowing them to reduce class sizes, offer higher salaries to attract better teachers, and make improvements to buildings. Schools were also able to increase the involvement of parents, and expand their provision of nursery education. But what’s important to grasp about policies that are targeted at specific areas is that they are not primarily intended to be a way of reaching individual disadvantaged children. In a previous blogpost we looked at the distribution of low attainment across regions in England, and found that even in regions with low attainment overall there are examples of high performance – and vice versa. As was pointed out by several authors in the 1970s, most pupils with low attainment do not live in areas with low overall attainment, so any intervention targeted at the lowest performing areas is only going to have a limited impact on the number of pupils with low educational attainment. This remains as true today as it was four decades ago. 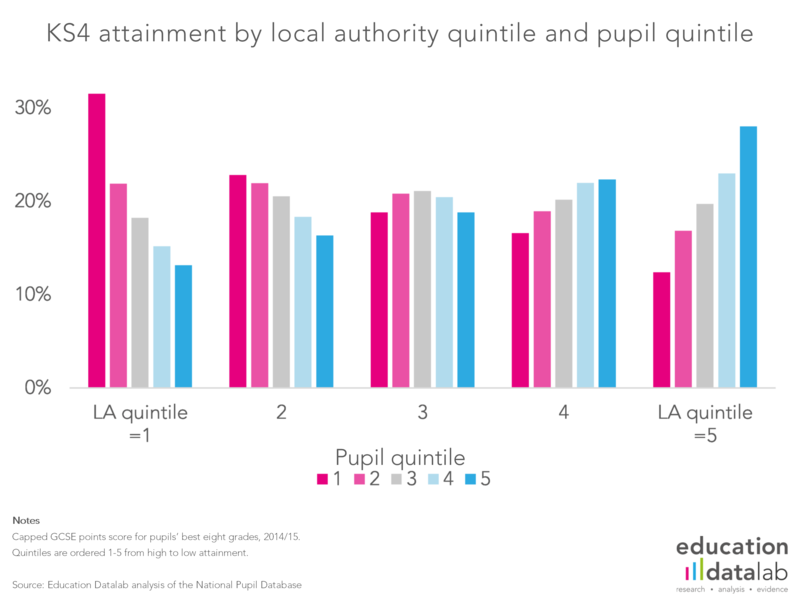 The figure below groups local authorities districts into quintiles based on mean GCSE attainment, then groups the performance of pupils attending school in these local authorities into quintiles based on how they performed nationally. It shows that the lowest performing local authorities have a much greater proportion of low-performing pupils than the highest performing local authorities – around 28 per cent of pupils in local authorities in the bottom quintile have attainment in the lowest quintile nationally; those local authorities in the top quintile have around 13 per cent of pupils in the lowest quintile. 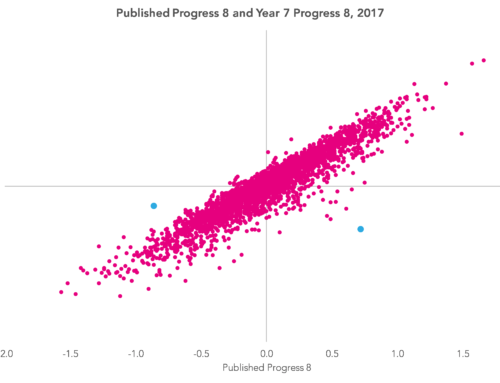 Running the analysis the other way round, though, only 27 per cent of pupils in the lowest quintile of attainment are found in the bottom quintile local authority districts. So any policy which tries to improve the attainment of the lowest performing pupils by targeting only the lowest performing local authorities would miss the majority of pupils with the lowest attainment. What lessons can be drawn from this? 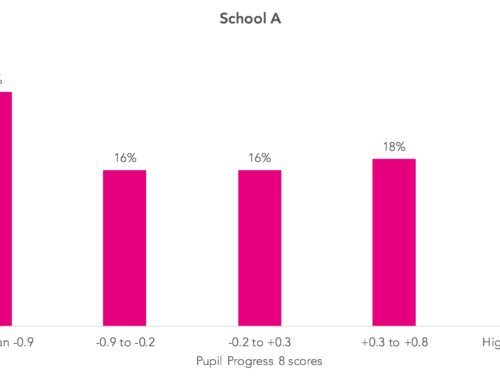 The difficulty of targeting the lowest performing pupils through area-based approaches means that governments should in most cases tend to favour education policies which put the focus on individual pupils. Area-based interventions do still make sense, though, where there are factors at the area-level influencing attainment. Such factors could include career aspirations. The March white paper also proposed a draft set of area-level indicators based on some plausible hypotheses about area factors which might be related to differences in attainment. These included the ability to attract and retain teachers with leadership abilities in schools, and the number of people attracted into teaching in an area. 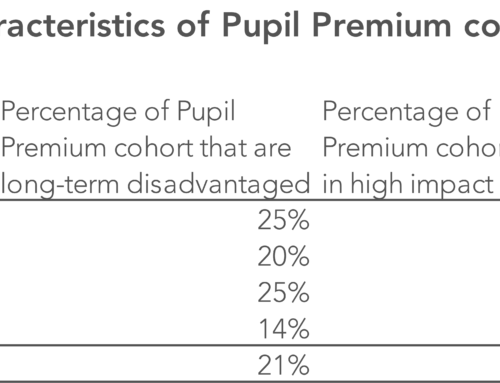 Policies which aim to improve the supply of good teachers in particular areas are certainly worth looking at, but these need to be combined with policies which are focused on individual pupils, such as the pupil premium. Not all researchers will agree on where the emphasis on area or individual policies should lie, but we need to have both area-based and individually targeted policies in order to combat educational disadvantage. 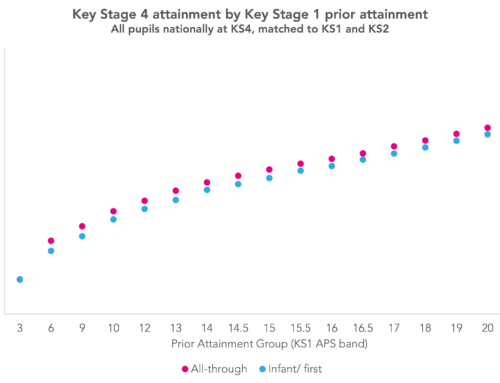 Why do pupils who went to infant and first schools appear to underperform at Key Stage 4?